Below are some links to popular media coverage of my research. Okay, worst blog post title of the year. But just trying to grab your attention and point you towards a nice USA Today article on doctors and emotional intelligence. • Should Your Doctor Cry With You? I spoke recently with a reporter from the USA Today, who ended up writing a nice article on bundled payments in healthcare. I wanted to share it with you here. The financial times, one of the great newspapers of the world, recently published a really nice essay exploring some of the controversies about what role, if any, behavioral economics should play in public policy. Here is a WHYY Radio Times segment I participated in about health care price transparency. When it comes to the cost of treating illness, do you know how much your care costs? With higher co-pays and deductibles, health care price transparency could be an idea whose time has come. It is too early to tell who will benefit and who will be harmed by Obamacare as the the law continues to unfold. In the absence of solid data, that leaves us with stories. Here are a few stories, reported on in the Fayetteville Observer, to give you a feel for the range of experiences people are having lately. Now that the New Year has arrived, it is of course the time for New Year’s resolutions. It’s also the time for columnists to write essays about New Year’s resolutions. One such essay came to my attention recently, because a financial columnist at U.S. News & World Report managed to weave in some research I conducted with Dylan Smith and Heather Lacey on people’s inability to predict how happy they will be as they age. In this Marketplace report, Dan Gorenstein explores the role procrastination played in all the last minute efforts to sign up for health insurance through Obamacare this year. Check it out to see how I managed to work “the Boss” into the story. In the wake of my recent New York Times op-ed, and other writing about patient out-of-pocket costs, I was interviewed by Tammy Worth, a writer at Renal and Urology News. She did a great job of exploring this controversial topic. Quite a while ago, I was co-author on a New England Journal of Medicine article arguing that HIV-positive patients, stable on anti-retro viral therapy, were now healthy enough to qualify as organ transplant recipients. Nevertheless, this practice remains controversial, as you can see from this story published by Al Jazeera America, telling a tragic tale of a man who did not receive a lung transplant. The American Society of Clinical Oncology is one of the leading specialty organizations for physicians who take care of patients with cancer. A reporter from ASCO just wrote a nice piece, in which she questioned me to go into more detail about the challenge of discussing cost of care with oncology patients. I thought I would share that with you. This summer I had the pleasure of speaking with a very intelligent journalist, who was working on an article about overtreatment in medical care. That article has just come out; you can check it out below. • Are You Getting Too Much Medical Care? NPR’s Morning Edition recently covered my research with David Comerford on effort aversion. Our research gives some insight into how people wind up in boring jobs. Here is a MedPage article discussing an article I co-authored in the New England Journal of Medicine in which we urge physicians to talk about out-of-pocket costs with patients. David Comerford and I conducted research that sheds some light on why people might stick with a dull job over something more exciting. A variety of media outlets are beginning to report on the study and ponder its implications. I recently spoke with a journalist from The Tennessean about the bargaining power Vanderbilt’s Children’s Hospital brings the university. I recently had the opportunity to take part in an AirTalk segment about “healthy” menus at fast food restaurants. It’s possible that the inclusion of healthy menu items causes people to choose items that are worse for them. Are healthy options good business? • Are fast food giants banking on sneaky “healthy halo” effect with new diet options? Most people don’t understand Obamacare and uncertainty can be a very powerful emotion. Both pro-Obamacare and anti-Obamacare ads are working off fear. The same procedure might cost as much as $25,000 at one facility, and only $1,500 at another. MSN Money looks at the debate over whether health care reform will do anything to rectify such pricing disparities and lower costs. As consumers pay more costs out of pocket, will they demand transparency in prices? This article explores the challenges of helping patients understand their medical decisions. The author, a physician, makes mention of some of my research. 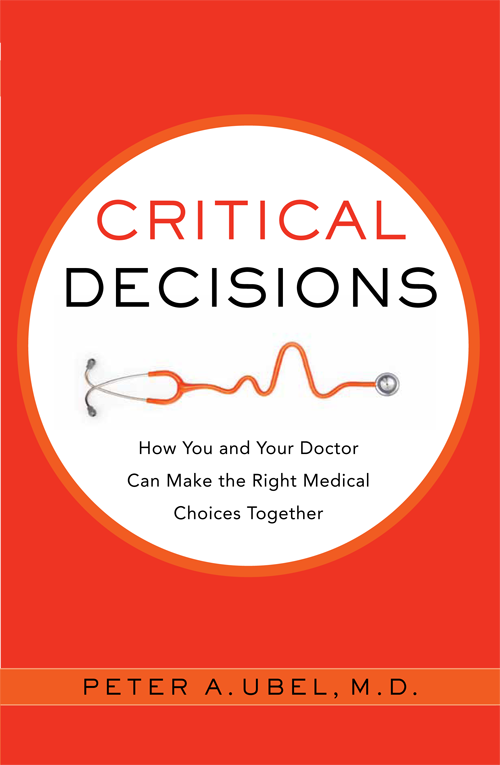 • How should doctors share impossible decision with their patients? Some think that most healthcare problems in the US would be solved by letting the power of an unregulated free market do its work. But is that wishful thinking and overly simplistic? • Why the free market isn’t a cure-all for healthcare. As part of Obamacare, people are required to get health insurance or pay a penalty. For some, the penalty may be as low as $95. Would anyone in their right mind, who is not otherwise inclined to buy health insurance, buy it just to avoid such a small penalty? • Will you buy into Obamacare or pay the penalty? Joanne Kenen looks at the boost shared decision making is getting from the Affordable Care Act. I was able to provide some insight as to where this new model fits into doctor-patient communication and medical decisions. A recent piece by a USA Weekend where I share ways to make stronger connections with doctors. Stronger connections can lead to great care! A great piece by a Forbes reporter discussing why rare disease treatments can cost as much as $400,000 per patient, per year. A nice article on Workforce.com, by a reporter I spoke to, on the potential hazards of high deductible health insurance. Pharma Times recently published an article on the costs and benefits of US cancer care. The article highlights studies published in April’s issue of Health Affairs, including a study I recently led on the inconsistency in how oncologists judge the value of high-cost cancer drugs in relation to survival gains. WHYY in Philadelphia has a report out on a new study I participated in, led by my good friend Scott Halpern. The study revealed the strange lengths to which physicians will go to help their patients, even if it hurts other patients. Brian Zikmund-Fisher took the lead on a study published this week in which we found evidence that when people face tough decisions, it helps for them to break the decision into smaller pieces, and take it one step at a time. An interesting article by Peter Schwartz in the latest Hastings Center Report on whether patients, facing difficult medical decisions, ought to get precise numbers on the risks and benefits of their alternatives. I contributed a commentary, urging researchers to keep developing better ways to help patients make rational use of the numbers. A bunch of media outlets are beginning to report on a new study of mine (conducted with a couple great colleagues) in which we found that docs choose different treatments for themselves than they recommend to their patients. Kinda scary stuff. Here is a news article discussing a paper I wrote with Michael Volk, in which we try to find ways to keep doctors from harming patients by finding and then getting all worked up over what we in medicine call incidentalomas–unexpected and ultimately benign findings that show up with unnecessary tests. The article is in the Archives of Internal Medicine this week. • Should radiology ignore incidental findings? As we get ready to turn the clocks on a new year, it is good to remember that for most of us, our happiness increases with age. See this recent news article which talks about some of my old, ahem, research on aging and happiness. Take a look at a brief summary of a new paper I just published, led by a wonderful medical student at Michigan, Michael Kozminski. It shows that oncologists seem to place far greater value on quantity of life over quality of life. I gave a talk as part of an ethics series here at Duke. Here is one take on my presentation. See if you can spot the Far Side reference! My colleague, Dr. Reshma Jagsi, and I found in a recent study that women are less likely than men to receive major funding for scientific research. Dr. Angela Fagerlin, my colleague at the University of Michigan, and I (along with several other colleagues) recently published a research study, and the findings have caught the media’s attention! Our study found that many women who have a high risk of developing breast cancer are not interested in taking a drug called tamoxifen to reduce their chances of developing cancer because of the serious side effects. Josh Gerstein delves into the debate that sprang up around the new breast cancer screening recommendations. I was able to provide some insight as to how and why people react drastically to such health-related information. My research colleagues and I (at the Center for Behavioral and Decision Sciences in Medicine at the University of Michigan) published an article in Health Psychology that will be available online November 17th. Our study found that colostomy patients who felt that their condition was irreversible reported better quality of life than those patients who hoped that they would be cured. My colleague, Dr. Sarah Gollust of the University of Pennsylvania, and I conducted an experiment to determine how people’s political beliefs are related to their attitudes towards health research and healthcare reform..
Michigan Radio’s Jack Lessenberry reviews my book, Free Market Madness. Jeff Meyers of Concentrate Media picks my brain! A nice piece on some of my favorite past research.